Let’s Diagram the Oath of Office! Just in time for tomorrow’s inauguration ceremony, but a little bit late for the actual swearing in that took place today, here is the presidential oath of office, as written in the Constitution, put into a tree diagram just for you! Over the years, I’ve used the PHP Syntax Tree Drawer to make my diagrams, but a couple of years ago, Miles Shang’s Syntax Tree Generator came online, so now I have two phrase-diagramming apps to choose from. I couldn’t decide which one to use this time, so I chose both! Now you can decide which style you prefer. Here’s the diagram from the PHP Tree Drawer, with the familiar blue labels and red words you’ve come to love, and the top node of the tree centered horizontally. Click to embiggen. Now here’s the diagram done with Shang’s Tree Generator, with blue node labels and green words. The top node of the diagram, like all the nodes in the tree, dominates branches of equal length, instead of making one branch reach much farther than the other, as you can see happens with the diagram above. Another nice thing about Shang’s Tree Generator is that it allows you to draw movement lines, so that if your theory of syntax has WH words actually moving from a place inside a clause to the front of the sentence (for a WH-fronting language like English), you can do that. On the other hand, the PHP Tree Drawer makes it easier to put subscripts on the labels. Look closely at my VP labels, and you’ll see that in the upper diagram, they’re subscripted to show whether they are nonfinite (headed by a verb’s base form in this sentence) or finite, but no such subscripts appear in the diagram below. In particular, you might not agree with how I’ve parsed the adverbs. For example, I’ve taken faithfully to attach to the entire VP execute the Office of President of the United States, but you could also make a case that it attaches just to the verb execute, and that this string then forms the VP with the Office of President of the United States. And as we were reminded in 2009, adverbs have some flexibility in where they can be placed in a sentence, so you could even experiment with diagramming faithfully execute the Office…; execute faithfully the Office…; and execute the Office … faithfully. Have fun! 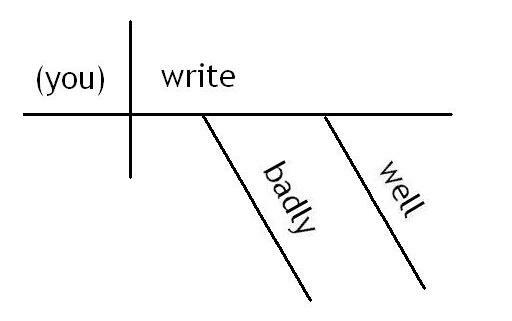 Having covered the basics of diagramming verb phrases (VPs) with intransitive, transitive, and linking verbs in my last post, I’ll turn now to adverbs and adverb phrases. I’ll use an intransitive verb to keep things simple: swim. The full sentence will be She swims very well, with the adverb phrase very well modifying swims. On the right is how it looks in a Reed-Kellogg diagram. As before, the subject is to the left of the vertical divider; the predicate is to the right. Well is attached to the horizontal bar underneath swims on a diagonal line to show that it modifies it. Since very modifies well, it is shown on a diagonal line, too, which turns 90 degrees to attach to the line for well. In general, modification is shown by having items on diagonal lines underneath the things they modify, with hooked diagonal lines to show submodification. On the left is how we’d diagram this sentence using a tree diagram. Well, actually, it’s just a diagram of the VP swims very well, since I don’t care about teh subject right now. This is one advantage of tree diagrams over R-K diagrams, by the way. You can diagram whatever phrase you’re interested in, without committing yourself to diagramming a whole sentence, or adding material to turn it into a sentence. Anyway, let’s look at this VP from the bottom up. 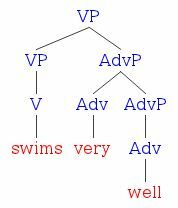 First off, swims the verb makes up a VP all by itself: She swims is a grammatical sentence. Moving on to the AdvP very well, notice that well is an adverb, and forms an AdvP all by itself. 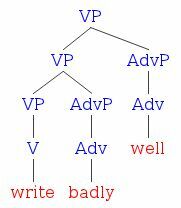 The adverb very is on a sister branch to the AdvP well, and together, very and well make … another AdvP. This is how modification is shown in a tree diagram: You have a node of category X, which branches into something of category M (the modifier) and something of category X again. In very well, X is AdvP, and the M category is Adv. Now look at the top node: It’s a VP. It branches into the AdvP very well, and another VP, swims. Once again, it’s the general pattern for showing modification. So far, so good. R-K shows modification with slanted lines; tree diagrams show it with the [X [X M]] or [X [M X]] pattern. One problem with the R-K system, though, is that all adverbs are shown modifying not an entire VP, but strictly the verb. On the simple example we’ve done, it’s no big deal, but now consider the verb phrase write badly well. 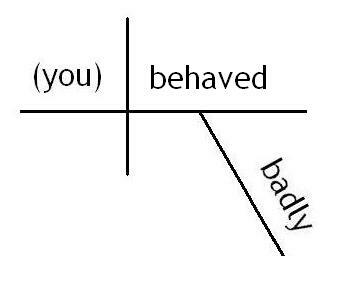 In the R-K diagram, the adverbs badly and well both appear on diagonal lines under the horizontal for write. Oh, and I’ll just put in an understood you for a subject, so we’ll have a whole sentence to work with. (This is how you represent subjectless imperatives in the R-K system.) The problem is that well doesn’t modify just write. It modifies the VP write badly, which means to do a good job of (deliberately) producing bad writing. But as represented in the R-K diagram, the phrase seems to refer to an impossible activity, of writing both well and badly at the same time. Now here it is in a tree diagram. The entire VP branches into a smaller VP, write badly, which is modified by the AdvP well. The smaller VP write badly branches into a third VP, write, modified by the AdvP badly. This is the structure of a VP that makes sense, and as far as I know, there is no way of showing this in the R-K system. This deficiency is a reflection of the tendency of traditional grammars to focus on relations between individual parts of speech, instead of between larger chunks of syntax. Last, let’s consider the VP behave badly. We’ll put it in a sentence so we can diagram it R-K style, and here it is. Nothing unusual here; the adverb badly goes on the diagonal line under behaved, right? The problem here is subtle. A modifier should be something that’s optional. Take away very well from She swims very well, and you’re left with She swims. We know she swims; we just don’t know if she does it well, poorly, fast, slow, or any other way. Take away badly from this example and you’re left with She behaved. Unlike the swim example, this doesn’t mean that she behaved in some manner or other. Used this way, behave has a more specific meaning of behaving well. It’s kind of like how He drinks doesn’t mean he drinks something or other and we don’t know what, but that he drinks alcoholic beverages. This is not the behavior of a modifier; it’s more like a verbal complement, like a direct object, or a predicate nominative, or a that clause after a verb like believe. As a tree diagram, behaved badly would look as shown on the left. 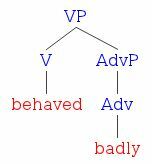 Notice that the VP node on top does not divide into an AdvP for badly and another VP for behaved. The verb behaved combines directly with badly to form a VP, just like the verb excites combined with me, and is combined with awesome in the last post. (More on the verb behave in this post.) 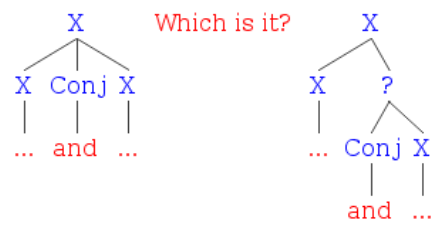 This is how a word and its complement(s) are shown in these diagrams: They are sister nodes under a mother node that’s not the same category as either of the daughter nodes. But wait? How do you know which daughter is the complement and which is the non-complement (i.e. “head”)? That’s for another post. The main thing here is that modification is shown by a mother and daughter node having the same label, while other relationships (such as complementation) are shown by having sister nodes under a mother node that has a different label from either daughter. And that modification is more accurately represented in tree diagrams than in R-K diagrams. Every now and then a reader will ask me why I don’t use Reed-Kellogg sentence diagrams, or what I think of them, or recommend them over the tree diagrams I use. 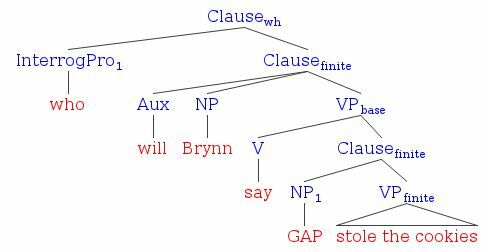 So I’ve decided it’s time to begin a series of posts comparing the two ways of diagramming sentences — or in the case of tree diagrams, phrases. They’re not limited to just sentences, which is one reason I prefer them. The most recent person to write to me about R-K diagrams is Martha Kolln, a retired English professor at Penn State, and author of several grammar books. She argued that R-K diagrams “clearly [show] the differences among transitive, intransitive, and linking verbs.” This seems like as good and limited a topic as any to start with, so here goes. I’ll start with intransitive verbs, with the sentence Syntax rocks. The R-K diagram of this sentence, shown to the right, has the subject to the left of the vertical line that crosses the main horizontal line. The verb rocks is to the right. That’s all there is to it, because rocks is intransitive, and doesn’t require any direct objects, predicate nominals, or any other kind of complement to complete the verb phrase. Now let’s see how this looks using a tree diagram. 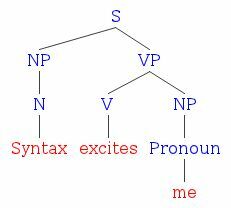 Since the whole thing is a sentence, the root node of the (upside-down) tree is labeled S. To show that this S consists of a noun phrase (NP) subject and a verb phrase (VP), this S node divides into two branches. On the left is the NP node. This NP consists of just the noun syntax, so it has only one branch coming off of it, leading to the N node. The “leaf” of this branch is the noun syntax. The VP node also consists of just one word, the verb rocks. So a single branch comes off the VP node, and ends in a V node, just above the rocks leaf. So far, the two systems are pretty similar, although the tree diagram explicitly gives information that the R-K diagram assumes you will have; i.e., the category and part-of-speech labels. 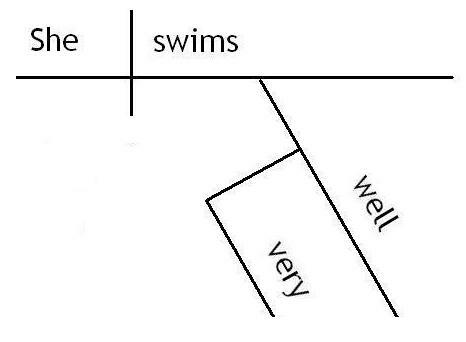 This will be useful for when we diagram isolated phrases that aren’t part of a sentence. Next up, a transitive verb, illustrated in the sentence Syntax excites me. As before, the subject is to the left of the vertical line that crosses the horizontal, and the predicate is to the right. This time the predicate consists of the verb excites, and its direct object, me. The direct object appears to the right of another vertical bar, which does not cross the main horizontal. This is the hallmark of complements of verbs other than linking verbs in the R-K system. Now for Syntax excites me in a tree diagram. The NP subject is as before. This time, the VP node branches into the V node for excites, and another NP node for its direct object. Thus, both systems distinguish between intransitive and transitive verbs. The direct object NP consists of the pronoun me, so just a single branch ends in a Pronoun node followed by the leaf me. Finally, let’s look at linking verbs, with the sentence Syntax is awesome, which contains the linking verb is and the predicate adjective awesome. The R-K diagram on the right is like the other two as far as separating the subject syntax from the predicate. R-K diagrams distinguish linking verbs from transitive verbs by having a slanted line instead of a straight line between the linking verb and its complement. The slanting line is supposed to indicate that the subject has the property named by the predicate adjective (or that the subject and predicate nominative refer to the same thing). 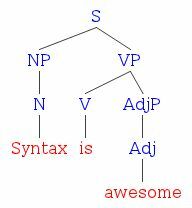 Represented as a tree diagram, Syntax is awesome has precisely the same branch structure as Syntax excites me. The differences are that the leaf labels excites and me are now is and awesome, respectively; and that the NP and Pronoun nodes under the VP node are now Adj(ective)P(hrase) and Adj, respectively. The identicalness of these trees means that this kind of diagram does not distinguish between transitive verbs and linking verbs: Both direct objects and predicate adjectives (and predicate nominals and predicative prepositional phrases) are represented as complements of a V — that is, as a sister node to a V under a VP mother node. How can a tree diagram represent the information of the slanting line in a R-K diagram? From a syntactician’s point of view, that’s not the diagram’s job. That information isn’t about syntax, but semantics. For that matter, neither R-K diagrams nor tree diagrams show that (at least in more formal varieties of English) pronominal complements of transitive verbs are in accusative case (e.g., They criticized her), while pronominal complements of linking verbs are in nominative case (e.g. It was she). To do that, you need enriched diagrams that can show features like these, but that’s a whole nother story. As a final note, I should note that both kinds of diagram will let you parse an ungrammatical sentence. You could easily diagram *Syntax excites awesome in either system. To rule it out, you need a set of rules for what kinds of diagrams you can make. In R-K, you need to have a rule that only linking verbs get to have the slanting line after them, and can be followed by an AdjP, and indeed, such rules are taught in the grammar books. For tree diagrams, you need something similar. But with tree diagrams, you have the option of putting some of that enrichment I mentioned above in the category labels, so that you can verify each branching is legit. Below I’ve re-presented all three sentences in this kind of diagram. 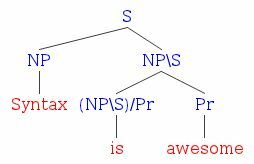 Here, the labels S and NP stay the same, and Pronoun is simply NP (because pronouns act as NPs). VP has been replaced by NP\S; that is, a VP is something that looks to its left for an NP, and results in an S. Instead of a simple V category for any kind of verb, we have labels showing what kind of complement the verb has to take before it can form an NP\S. Intransitive verbs are NP\S already! Transitive verbs are (NP\S)/NP; that is, they look for an NP on the right before they become an NP\S looking for a subject. Linking verbs are (NP\S)/Pr, with Pr standing for Predicative. This category covers predicative NPs, AdjPs and P(repositional)Ps. The adjective awesome is given the category Pr, since it can act as a predicative adjective phrase. (A noun such as former, though, which can’t be predicative, wouldn’t have this category. Instead, it would be N/N: something that looks for a noun on its right, and results in a bigger noun.) 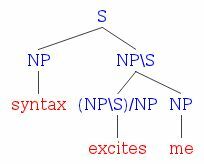 Syntax, by the way, is an NP only because it’s a mass noun, which can act as an NP. A count noun such as sentence would have category N, and would have to combine with something with category NP/N, such as the, in order to form an NP. The nice thing about this kind of presentation is that at each branching node, you can see the label in the denominator of one daughter node get “canceled out” by the label of its sister node. For example, at the S node, you can see the NP in the denominator of the daughter NP\S node get canceled out by the NP of the other daughter node. It was neither more nor less than a pig, and she felt that it would be quite absurd for her to carry it any further. So how would you analyze these sentences in tree diagrams? 1. Alice was just beginning to think to herself, ‘Now, what am I to do with this creature when I get it home?’ when it grunted again, so violently, that she looked down into its face in some alarm. 2. This time there could be no mistake about it: it was neither more nor less than a pig, and she felt that it would be quite absurd for her to carry it any further. Let’s give it a try. I’ll tackle It was neither more nor less than a pig, and she felt that it would be quite absurd for her to carry it any further. The first thing we can do is notice that it’s a compound sentence, composed of two independent clauses joined by an and. This is typical of phrases joined by and: If the component phrases are of category X, the phrase as a whole will have category X, too. (And if the component phrases have different categories, which does happen? I’m not even going there today.) There are a couple of ways we could diagram this, shown below, and linguists have yet to agree on which approach reflects better what’s going on in human language. The diagram on the left says that a coordinate structure has three parts: the two things that you’re coordinating, plus the conjunction. The diagram on the right says that a coordinate structure naturally falls into two chunks, not three: The first thing you’re coordinating, and a chunk consisting of the conjunction and the other thing you’re coordinating. Where I’ve put a ? label, there is further contention over what kind of phrase this is. To simplify things, I’ll go with the approach on the left. Notice that I’ve labeled the pronouns Pro for short. (Actually, this is a bad choice on my part, since syntacticians often use Pro to refer to missing pronouns, but I’m not going to redraw the diagrams now. I’ll just make it each have only one branch coming down from them; that means that these NPs consist of only one thing, namely a pronoun. Things are going to get more complicated now, as we move down into the sentences. What are we going to do with the correlative conjunctions neither … nor? What about the “dummy it” in it would be quite absurd to carry it further? 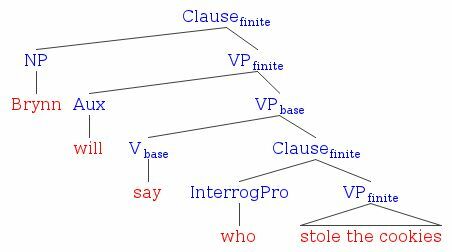 In the Reed-Kellogg system of diagramming sentences, the answer to that last question would be to recast the sentence as to carry it further would be quite absurd, and then use the infinitive as the subject. But in the tree-diagramming system I’m using here, we’d like to show the structure of the sentence without destroying the information about how it’s actually spoken or written out. So stay tuned for the next post, where we’ll kick it down to the next level, so to speak!